A prescription foot orthotic is an in-shoe brace which is designed to correct abnormal foot and lower extremity function. In correcting abnormal foot and lower extremity function, the prescription foot orthotic reduces the strain on injured structures in the foot and lower extremity, allowing them to heal and become non-painful. In addition, a prescription foot orthotic helps prevent future problems by reducing abnormal or pathological forces acting on the foot and lower extremity. Podiatrists prescribe two main types of prescription foot orthotics for their patients, accommodative orthotics and functional orthotics. Both types of prescription foot orthotics are used to correct foot function of the patient, so that the pain in their foot or lower extremity will improve. However, accommodative and functional orthotics are generally made using different materials and may not look or feel the same. Both types of prescription foot orthotics are nearly always prescribed as a pair to allow more normal function of both feet. Accommodative foot orthotics are used to cushion, pad or relieve pressure from a painful or injured area on the bottom of the foot. 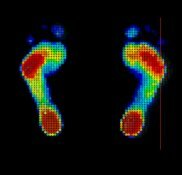 They may also be designed to try to control abnormal function of the foot. Accommodative orthotics may be made of a wide range of materials such as cork, leather, plastic foams, and rubber materials. They are generally more flexible and softer than functional foot orthotics. Accommodative orthotics are useful in the treatment of painful calluses on the bottom of the foot, diabetic foot ulcerations, sore bones on the bottom of the foot, and other types of foot pathology. The advantages of accommodative orthotics are that they are relatively soft and forgiving, and are generally easy to adjust in shape after they are dispensed to the patient to improve comfort. The disadvantages of accommodative orthotics are that they are relatively bulky, have relatively poor durability, and may need frequent adjustments to allow them to continue working properly. Functional foot orthotics are used to correct abnormal foot and lower extremity function. Some types of functional foot orthotics may also be designed to accommodate painful areas on the bottoms of the foot. Functional foot orthotics may be made of flexible, semi-rigid, or rigid plastic or graphite materials. They are relatively thin and easily fit into most types of shoes. Functional foot orthotics are useful in the treatment of a very wide range of painful conditions of the foot and lower extremities. Problems such as great toe joint pain, lesser toe joint pain, arch pain, heel pain, and ankle pain are often improved through treatment with functional foot orthotics. Since abnormal foot function causes abnormal ankle, knee and hip function, functional foot orthotics are also commonly used to treat painful tendinitis and bursitis conditions in the ankle, knee and hip. The advantages of functional foot orthotics are that they are relatively durable, infrequently require adjustments and more likely to fit into standard shoes. In order to design and fabricate prescription foot orthotics, the podiatrist must perform a biomechanical examination of the feet and lower extremities. All structural and functional deformities are noted. Dr. Fisher then scans patients’ feet utilizing a state-of-the-art computerized foot scanner to produce a digital foot print. This information is then used in the design and fabrication of the prescription foot orthotics.